The Australian Commission on Safety and Quality in Health Care has released several patient decision aids on antibiotic use. Patient decision aids are tools that provide high quality, synthesised information about particular conditions. They can help patients and clinicians compare the risks and benefits of treatment options, clarify what matters most to the patient and make a shared decision about what is the best option for the individual. 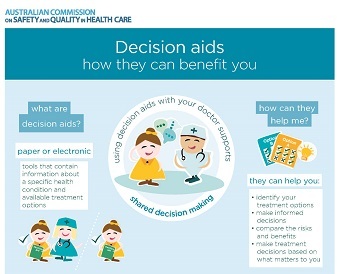 Using a patient decision aid can be particularly helpful when there is more than one reasonable treatment option, when no option has a clear advantage in terms of health outcomes, or when each option has benefits and harms that patients may value differently. For more resources designed for health professionals, see our resources page.